Jill Iliffe (b. 1962), Banned, c2007, oil on canvas. Image: National Football Museum. © Jill Iliffe. 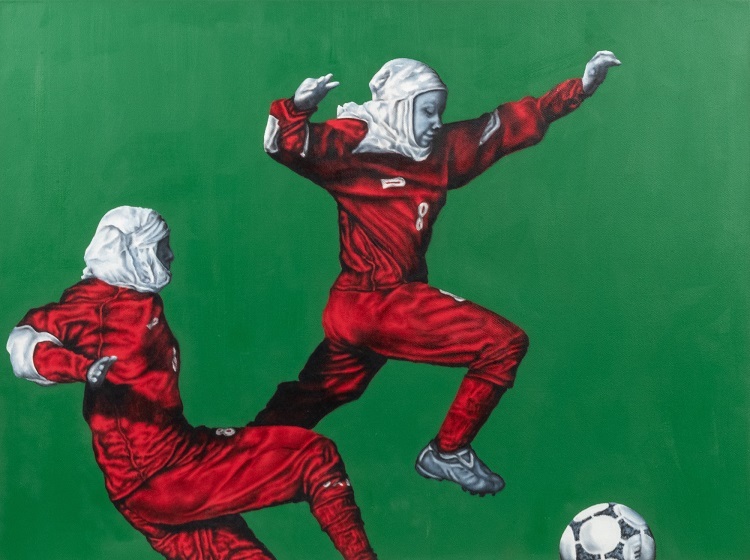 From a painting that lay forgotten about in a drawer for sixty-five years, to an early work by this country’s most famous street artist, the National Football Museum’s latest exhibition, Football Is Art (opens Friday 5 April) brings together a collection of over seventy artworks and sculpture. Paul Nash (1889 - 1946), Pony the Footballer, 1921. Woodcut proof. Image: National Football Museum. Accompanying the new purchases will be existing works from the museum’s collection, alongside artworks which are on loan specially for the exhibition. Banksy’s Football Terrorist which is privately owned will be on display for the first time in a museum in the UK, while Yellow Strip by Rose Wylie will be the first time one of her works has been featured in an exhibition in Manchester. Other highlights include Mid-week Practice at Stamford Bridge, by Laurence Toynbee, which was an equal prize-winner in the 1953 Football and the Fine Arts competition alongside L S Lowry’s Going to the Match. Football Spectators in Rain is another work submitted as part of the 1953 competition. 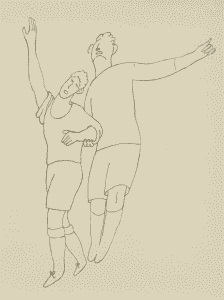 Afterwards artist Karel Lek rolled the painting up, put it in a drawer and left it there for sixty-five years until someone at the National Football Museum saw a copy in a catalogue, traced Karel and offered to buy it. 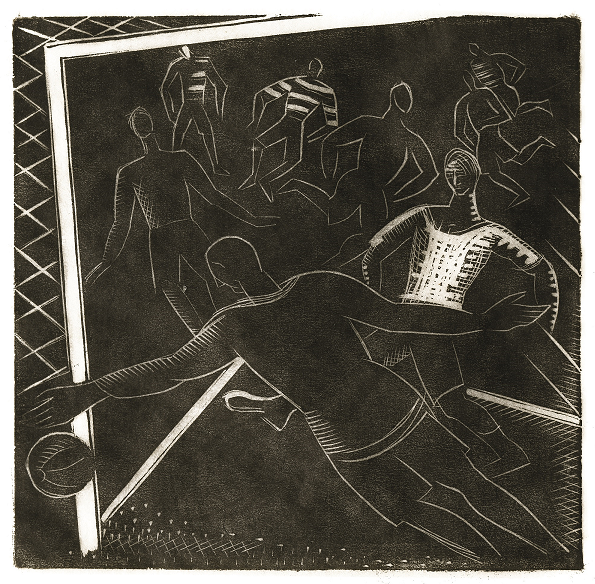 Other works include a line drawing Foot-ball Annonciation by French poet, filmmaker and artist Jean Cocteau and an etching and aquatint Moment of Victory by experimental printmaker Michael Rothenstein (also submitted as part of the 1953 competition). Also on display is a range of sportswear inspired by some of the artworks and designed by Fashion Design and Technology students from the Manchester Fashion Institute (MMU), while visitors will get the chance to create their own 3D interactive works of art using Google Tilt Brush. 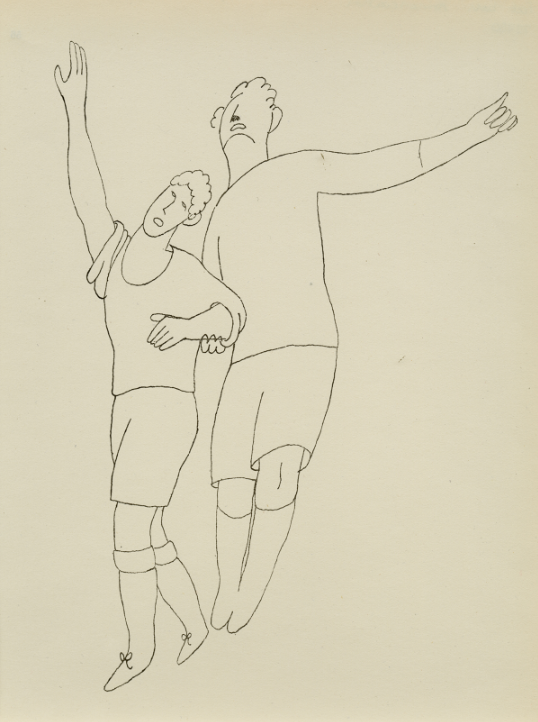 Jean Cocteau (1889 - 1963), Foot-ball Annonciation, 1923. Linecut. Image: National Football Museum. © DACS / Comité Coteau, Paris 2019. ‘The starting point for this exhibition was the 1953 Football and the Fine Arts competition, which was organised by The Football Association and the Arts Council of Great Britain to break down barriers between football and art. Football Is Art opens on Friday 5 April 2019. Admission to the exhibition is included within the ticket price to the museum.